" South Jakarta is a primary area of potential with the presence of culinary, shopping center, office and residential elite"
As many as 150 small and medium enterprises (UKM) under South Jakarta Administration get a online marketing business training in the multipurpose belongs to South Jakarta Mayor office, Thursday (11/17). They are given training and clue how to promote product via online website. South Jakarta Mayor, Tri Kurniadi disclosed training is supporting the increase and growth of the UKM's economic and optimize advances in Science and Technology Human Resources (IPTEK). Moreover, the UKM potential in the field of culinary in South Jakarta is very potential. "South Jakarta is a primary area of potential with the presence of culinary, shopping center, office and residential elite," he stated, Thursday (11/17). 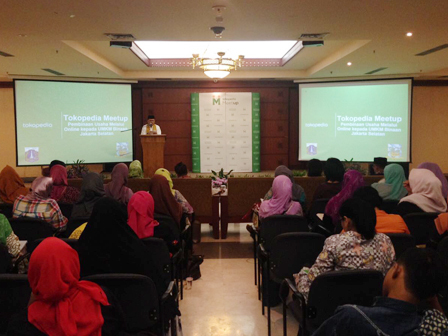 Head of Jakarta KUMKMP Dept, Irwandi explained, training is also to familiarize them doing non-cash transaction. With the online system, they are also not going to bother with the rental place. "We'll see and monitor this development, as well as we will evaluate," he stated. Not only in South Jakarta, his side also plans to form a community for UKM development.